New Belt Loops/Pins for 2010! The Boy Scouts of America is pleased to announce the introduction of 13 new belt loops and pins as part of the Cub Scout Academics and Sports program. It has been more than 10 years since new topics have been added to the program, which is supported by the Cub Scout Academics and Sports Program Guide, No. 34299. Look for the new blue cover on this new edition, available for sale the end of January 2010 in stores and online at www.scoutstuff.org. Belt loops and pins are a great way to help Cub Scouts fulfill the aims of Scouting-building character, developing citizenship, and encouraging mental and physical fitness. Through a variety of subjects, a boy can stretch his mind and abilities by exploring the wonders of science, learning about the world around him, and expanding his skills in new areas. Crusader Patrol’s Public Service Announcement – NO JOKE, DON’T SMOKE! Here’s a link to the Crusader Patrol’s Public Service Announcement titled “No Joke, Don’t Smoke” that was shown at our December Pack Meeting. If you go to this website (www.LetsSayThanks.com) you can pick out a thank you card, and Xerox will print and send it to a soldier serving in Iraq or Afghanistan. You can’t pick out who gets it, but rest assured that your card will go to a member of the armed services. How AMAZING would it be if we could get everyone we know to send one? The process is FREE, and it only takes a second. Please take the time to pass it on for your friends and family members to participate in this project. DON’T FORGET – OUR HOLIDAY MOVIE NIGHT IS THIS FRIDAY AFTER THE PACK MEETING! Bring your pillow and sleeping bag. The attached Pinewood Derby rules were approved by the Pack Committee at last night’s committee meeting. Since many of you will probably start working on your Pinewood Derby cars during the upcoming Winter Break, please take the time to familiarize yourselves with the rules. Many of these rules are new for 2010, so please read the attached document very carefully. 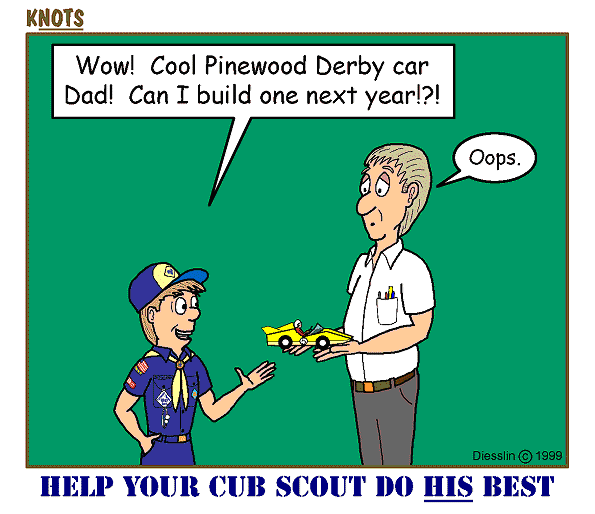 Please note that the Pinewood Derby is for the Cub Scouts. Parents should assist the boys around power tools, but the final project should be designed, built, and painted exclusively by the Cub Scout. We will have a special Family Pinewood after the January Pack Meeting so that parents, siblings, and den chiefs can participate. Information about the Family Pinewood is provided in the attached Pinewood Derby Rules document. To emphasize: Please make sure that the car that is submitted for judging is solely and exclusively the work of your son. Offer guidance, but let this be the boy’s accomplishment. Please note: Cub Scouts and adults can begin to check in their cars at 11:30 AM. It is highly likely that the busiest time to check in cars will be between 12:30 PM and 1:00 PM. Plan ahead – the races begin at 1:00 PM sharp, and we will not wait for anyone to get through the check in process. An early check in will allow for minor repairs and will make the race much less stressful for everyone involved. Please arrive and check in early! Concession stand opens at 11:30 AM with lunch, snacks, and drinks. We will be showing the movie “Down and Derby” (http://www.downandderby.com/) from 11:30 AM until 1 PM, and we will have a number of other activities. Once the boys check in, they should plan to watch the movie or participate in the activities. We want the check in process to go smoothly, so we are allowing plenty of time prior to the race time. Pinewood Derby participation awards for all participants. To streamline the process, we will be having “celebrity” judges who will determine the 1st, 2nd, and 3rd place winners in each den on the basis of design. As a way of making this run more smoothly (especially since we are going to be straddling lunch time), the committee is planning to put together a concession stand that will sell lunch (hot dogs, slices of pizza, etc. ), drinks, and snacks. 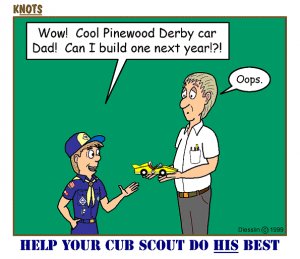 The profit from this endeavor will be used to offset the Pinewood Derby cost. If you can help staff the Concession Stand, please contact our Pinewood Derby Concession Chair, Donna Pieciak, at donnap827@comcast.net.